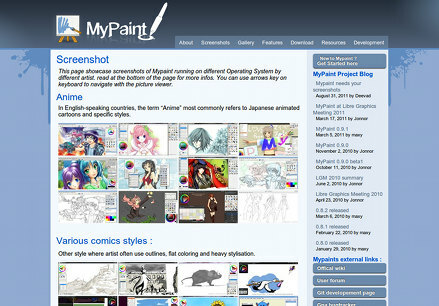 Click on the picture to access the Mypaint official webpage. Many thanks to all the contributors to my previous call for Mypaint screenshots. Finally, it endend-up with more than 150 screenshots pictures from all around the world, with many various systems and artworks style. This website update is a success ! License: CC-BY David Revoy, www.davidrevoy.com, 9 september 2011 . Maybe it's just me, but I think Mypaint's range and potential would be better represented if you put the 'Illustration' or 'Traditional' section at the top. 'Anime' has a narrower target audience. For me, all is very good. I disagree with anonymous about the order (troll-inside ? ), because what is matter is the navigation on the website. - (in my mind : how are the different user experiences about this software ?) clic on "Screenshots"
- (clean page, with abvious categories) "Anime" : not my type, but interesting shiny effects ; "Various comics styles" : i like (normal you could say, there are some of mine) ; "Concept art" : some of them are impressive, but there are some less professionnal works which show me that this software is an easy tool ; "Illustration", similar as previous, but further impressive ; "Traditional ", idem. Time on all the page : 2 min, and I went to the end. My last think about this page : wahoo, we can do everything ! For me the order is ok, moreover first categories are very short. Well done Deevad, you have done a great work, and because I am not a programmer, I am proud to have participated this way to your action of promoting Mypaint. So many styles, so many technicks, from beginners (like me) to professionals. I'm glad that I can help opensource community. I think the page is really cool, there are different levels of users, remember they are users and not al of them are proffesionals, but this is good because mypaint is not only for profesionals. if we only show the bests works then people could think , it is a complex program. and the "philosophy" about mypaint is the opposite.Easy painting tools. I agree with Tapee, we can watch a lot of images at first view. and if someone interest us, then click on it. Thanks Deevad for take your spare time to do this. and also thaks to include me. Yes, it was a real brainstorming to try to sort them properly. My first thinking was : "it's Mypaint new user community , and not a gallery for a commercial package ; so I don't have to show 'only top works', no need to convince someone to buy something. Lets just showcase everyone to thank everyone who use it first..."
For the group as Anime/Comics/Concept ...etc... ; they are sorted in alphabetical order. Easy way to feel not really responsible of who is behind who or not. For not entering each pictures manually , I developped a *.sh script to resize thumbnail with the library imagemagick and output the good html code for the wordpress page. This script + uploading in FTP them saved me time ( or I would still be into the wysiwyg wordpress applet to enter image manually ). Btw, I will continue to work on the website soon. Thanks David, I agree with Ramon Miranda. The website looks really good. The feeling of fun, simplicity and diversity is clearly there. The "brush blend mode" to cancel on the toolbar! Although can set up shortcuts,But the inconvenient! Can have custom the Toolbar. Good! Look forward to support Brush Texture!